The Sovereign Military Order of Malta is the continuation of the medieval order of Saint John of Jerusalem, known as the Knights Hospitaller, an order founded in Jerusalem in the middle of the 11th century to provide care for poor and sick pilgrims. After the conquest of Jerusalem in 1099 during the First Crusade, it became a military order under its own charter. Following the loss of the Christian territories to the Muslims in 1291, the Order established itself on the island of Rhodes in 1310, until this was conquered by the Turks in 1523. Emperor Charles V gave them Malta in 1530 as a sovereign state, with approval of Pope Clemente VII. Until this island was conquered by Napoleon in 1798. The Order of Malta has now its headquarters in Rome and is considered sovereign. It has abandoned its military aspect and focusses on hospitaliter and charitative works. 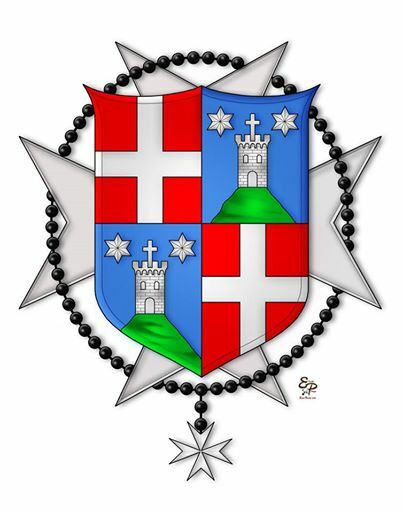 The head of the Order is a Prince and Grandmaster, the 80th one is Fra' Giacomo Dalla Torre Del Tempio, Conte di Sanguinetto. The family Dalla Torre is originally from Treviso, patrician of Treviso 4-5-1510, reconfirmed 31-3-1572 and authorized to add Del Tempio to the surname. Conte di Sanguinetto since 2-7-1905. 37. Eleonora Lucrezia Zorzi * ... 38.